Your steel building kit will arrive via one of our trucks or by one of our contract carriers, Federal Express Freight or Estes Freight, to the freight terminal nearest you. Residential delivery of your frame system is available for a modest extra charge but is not encouraged unless you have a lifting device such as a forklift or tractor with a front bucket. 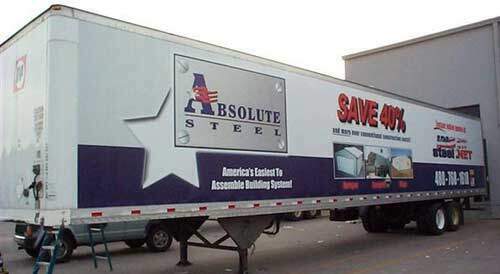 Steel buildings shipped from us to you! The freight terminal will be furnished with the telephone numbers you give to us and they will call you when your kit is in. We will also notify you when your building kit ships so you’ll know about when to expect their phone call. When arriving at the terminal, you should have a regular sized pickup truck or a small trailer to transport your building kit. The pallet that holds most building kits exterior panels is 128” long, so if using a pickup truck only, you’ll need to put the tailgate down and use ratchet tie-down straps to secure the load. The terminal has the proper equipment to get the kit into your truck. Be sure to ask your sales representative for the dimensions and weight of the building kit that you purchase so you have the proper truck or trailer. All of our frame systems are designed for compact packaging…even our full-sized steel buildings! On rare occasions, it sometimes happens that the building kit gets unbundled and if that occurs, make a note of that on the Shipping Manifest or Claims Form when you pick it up or when it’s delivered. Be sure to get the driver’s signature on the same form in the event there are any missing parts but that doesn’t happen often as the parts are large enough to not be easily lost. The carport or garage panels are packaged with every precaution in mind with regards to transporting them safely and without damage. There is a protective (scrap) panel on the top then they are bundled together with boards to keep foreign materials from coming in contact with them and finally, all that is strapped to a specially made pallet that makes the whole package easy to handle for the freight company. The trim pieces are packaged in a long crush resistant tube which is strapped to the same pallet. Should any damage occur to the panel package, do the same as described above: note the damage on the Shipping Manifest or Claims Form and have the freight company’s representative acknowledge by signing on that form. Note: Any pictures you can send of damaged parts are very much appreciated! Please fax or mail a copy of that form to us so that in the unlikely event there are any missing parts, we can arrange for reimbursement by the freight company. Assuming you have mailed, emailed or faxed the Claims Form / Shipping Manifest, you will not have to wait until the freight carrier has settled the claim. We will ship out the missing parts immediately.